An Enabling e-Learning forum: Coding, digital literacy or a new kind of language? In the holidays, several students in Tauranga (yr 3-6) got to do what most kids would love to do, - go back to school! Codebrite school that is, where they got to play with iPads and robots learning simple programming and computer coding language. The kids were buzzing, the parents were intrigued, all-in-all, it was a success. 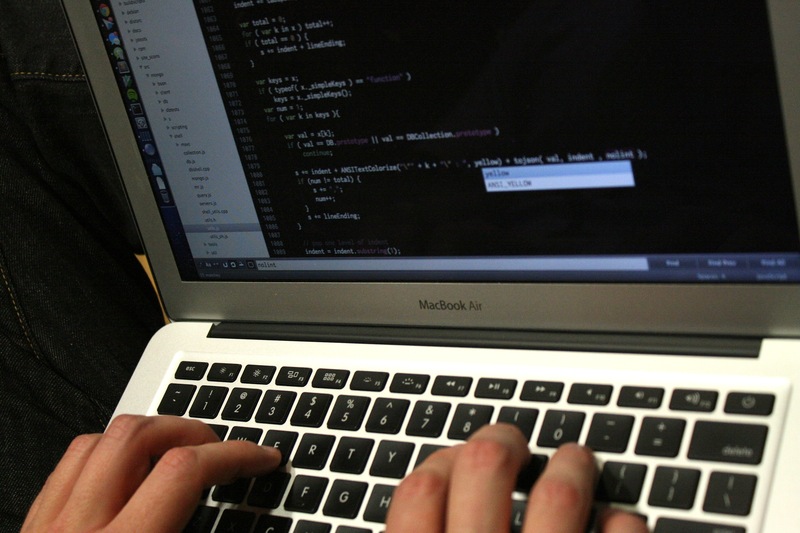 CareersNZ indicates the amount of programmers in New Zealand are growing steadily, the job prospects are ‘good’ and for a bonus IT jobs are some of the highest paid in New Zealand. How can we start coding? So if this is new to you and the teachers in your school, where could you start? This article in the Interface Magazine is well worth a read, “If it’s something you’d like to introduce in your classroom, there are plenty of simple and effective ways to do it…” then find out more at Meeting the challenge of computer coding. If you are teaching programming or computer science in your school, what 5 top tips would you offer as a starting point? Feel free to add your ideas to this shared Google presentation here >>>. Coding the NZC: What New Zealand Schools are doing to reprogramme their classes? Pond: Search for buckets on coding. I am going to start coding this term with my Year 3-4 class. It's something I have been interested in for a while but a bit nervous to try because I don't know a lot about it myself. However I have realised there is a wealth of resources available and that it's going to be OK to learn alongside my students. Our inquiry concept for term 3 is design so we will be 'designing' our own computer games. I am going to introduce code to my class using the hour of code resources (code.org) and then we will be starting off by using Pixel Press 'Floors' which is an iPad app. We are not a 1:1 school and currently only have 1 iPad per class so I am looking at a way I can get more devices but may have to explore other resources, such as Tynker, Gamefroot and Scratch, as we do have more desktop computers and a few laptops. Also the Google CS First resources look really cool (http://www.cs-first.com/) I'd love to hear from anyone else who's tried coding with this age group! Planning to get stuck in next week! Hi Mrs B30, If it's any help, I don't know a lot about the technical coding either, but what we are good at as teachers is to knowing how to google the answer we need and point students in the right direction. Maybe explaining to your class that web developers don't know all the code either, but they do know how to look it up and review if it's what they want to use. They use a "Timebox" to do a "Spike" (have a set amount of time to explore the possibilities) ie spending 1 hour finding out which calendar component would be best to use. In Scratch terms, it might be a 20 minute Timebox to find out how to make the Sprite do a particular thing? This time involves a lot of discussion and collaboration! That sounds great. Would be a good starting point having a set time to get something to happen! I have been using Scratch with my coding club. There are free resources on http://www.codeclub.nz. These are step by step instructions and the children are loving them. Scratch needs flash player so no good for iPads. I use ScratchJnr with Junior pupils, and also there is Pyonkee a version of scratch for the iPad. I felt exactly like you MrsB30 and decided to give Scratch a 'go'. I teach year 5/6. Initially, I let my students explore. Most of the kids were really keen but weren't that enthusiastic. I decided to try out the free lessons Scratch have on their website. They start from very basic and includes challenges. After lesson one, my whole class was fired up! I think learning the initial basics e.g. have two creatures jumping on a trampoline in different speeds made them realise that you can use Scratch for more than game making e.g. story telling. I have also used it as part of my reading programme - read and follow instructions and creating according to the challenges. Some of my students have worked on their projects at home and are now becomming quite sophisticated coders. I'm fortunate to be relief teaching and working with a PD student at UC, who is researching Computer Science in primary schools. It's a great time to be bringing what I learnt in the IT world back into the classroom! Here's some of the tools I've used this year with a wide range of year groups and the projects we've completed as a class or group of students. to work through a sequence of events and work out what the next logical order might be. to push the boundaries on an idea to make it work for other people to use. Written a "food fighting" game in Hopscotch - to learn about iterations and using values. In Scratch we've created a quiz to help the year 3/4 team identify famous landmarks. We "coded" Bo Peep finding her sheep using math's 10 frames, pictures of sheep and a doll as Little Bo Peep to work it out. What I'm noticing more and more is students are excited and motivated by Computer Science. All ages get the "buzz" of creating something themselves and although perseverance varies from group to group, the level of collaboration increases with each session and they are keen to "pair review" each others programming to check it works. By using adapted Agile methods to manage the projects, all projects are completed and layers of complexity are then added. Accountability is high, because they will be asked "Where are you up to?" "What's next?" and "Are there any obstacles?" I think that's it so far, can't wait for the next project! Thank you TraceyH for putting the excellent resources of csunplugged.com on this forum. This is a great resource that looks at the concepts behind programming. A number of students want to know the why? Why do we need to know how to program, what is happening behind the screen. Starting to look at ideas of binary, data representation, error checking enables students to start to making connections. There is even a free book of the activities available for download. To most people this will be something new and out of their comfort zone. While there are a great number of resources in how to code online, there is nothing like having someone who does it for a living in the room with you. http://codeclub.nz is a nationwide network of volunteer led after school coding clubs. From their website, "We create projects for our volunteers to teach at after school coding clubs. The projects we make teach students how to program by showing them how to make computer games, animations and websites. Volunteers go to their local primary or intermediate school or other venue, such as a library, for an hour a week and teach one project a week." Going along to these not as a teacher but as a student is one of the best forms of PLD that you will get. Not only will you be working on the same problems as the students, but you will also experience the same amazement in getting a program to work. Going through the projects will give you the confidence yourself to be able to offer this within your own classroom with your students. Keep an eye out on the website as well meetup.com http://www.meetup.com/Code-Club-Aotearoa/ for events in your area to get together with industry and codeclub.nz to make a partnership that will change the way you deliver an exciting technology in your classroom. I think you’ve summed it up nicely Gerard when you recognise this area is new for most teachers. We certainly don’t have a prescribed curriculum (like overseas) for computer science as such (especially in the primary sector), but I think there is a growing interest in how we can include computational-type skills into our learning programmes. I can understanding your perspective Mrs B30 - how to start out and where to go for support that's relevant to your learners. There’s a huge plethora of tools and information and it’s been invaluable going through the Google doc Gerard shared on, Coding the NZC: What New Zealand Schools are doing to reprogramme their classes? which makes alignments to the Key Competencies and Curriculum levels in a NZ context. Urmi, Warren and Katarina, thanks so much for your top tips on software/applications to start out with. TraceyH, your ideas are invaluable too – demonstrating coding as a form of digital literacy. This is cheeky, but it would be great to see some examples or screenshots too. Also wondering if anyone has any planning ideas/examples as well? For example, planning links to problem solving in numeracy, literacy (like Tracey’s Little Bo Peep example) or cross-curricula links in Inquiry models perhaps. I’m also wondering if there are secondary teachers who could share their planning/lessons too? What did you want the children to learn in coding (instructions, html)? How did/could this relate to authentic learning scenarios (Curriculum)? What kind of programming tools (software, apps, web-based) can enable a rich learning experience to happen? Rachel Bolstad (Senior researcher NZCER) and Dan Milward (CEO Gamelab) talk about the benefits of using games as an environment for learning. They discuss how playing games allows students to build knowledge and create things they’re interested in to see what they can do with it. Dan shares how in a workshop where students are creating games, they’re learning computer programming, the theory of game design, and the subject matter the game is about all at the same time. Don't miss out this week. Minecraft joins the hour of code. code.org/mc https://twitter.com/BillGates #hourofcode You can find out more in the VLN post @ Hour of Code - Minecraft Tutorial Dec 7-13. I can add some more to this especially useful for PC users on one front and those using Windows 8 or 10 on another. Have you heard there is an Hour of Code going on? A few years back I was giving Scratch a go as well but needed to pull back a step or two to bring the reluctant ones in. I stumbled across Microsoft Game Lab's Kodu at about the same time. In other countries this would allow the students to create a levelled game that could be played on their X-Box. After creating our first games we discovered this was not so in NZ - the students needed their laptops. The coding itself is exceptionally easy to work with for students. I, like others have mentioned here, taught myself the basics, found Microsoft's instructional videos and unleashed my class on it. There was far greater buy in from the students, they loved playing classmate's games and challenging each other to push the boundaries ever further. There was a core group of boys who were in my room in wet lunch hours, also involved in Minecraft and part of the Wanganui Intermediate medal winning Lego Mindstorms robotics team as well. How did I use it in the classroom? We created settings for use in descriptive writing, developed characters for the same purpose, explored the sustainability aspect within the game structure, collaborated, trialled, problem solved and communicated in ways I could not have planned for in your average lesson. Kodu also has a much newer and flashier big brother in the form of Project Spark which I have not personally played with nor coded in. This is available to the students on X-Box so the game they create can be played, added to, changed, and improved. Any feedback on their game can be given by many players - not just their classmates. Like those above I encourage you to give it a try, let go of being the expert and enjoy watching the learning happen around you. Get involved in the Hour of Code that is taking place this week. Simple coding, similar to Scratch, broken down into bite sized chunks with how to videos that teach the students as they go. What do you have to lose but an hour?